It has been exactly one month since returning back to Australia from a 2½ month adventure around the world. Having my last stop in The Big Apple (New York City), I was absolutely disgusted in myself for not having had a classic New York style bagel, given the amount of touring I had to fit in a span of just under 48 hours. Cue in the angelic halo over the duo behind Bagel Street Adelaide – Ash and Kaya. 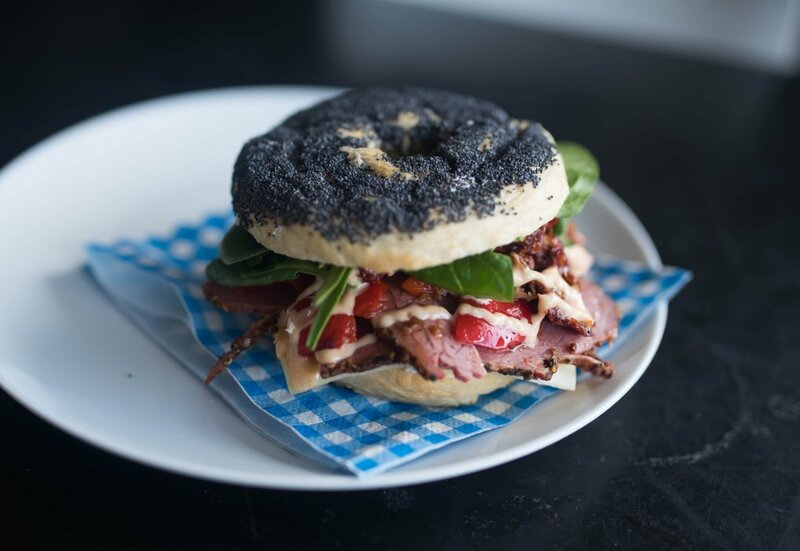 The team at Adelaide Food Central was invited to sample a piece of America through these guys, and we’re pretty sure we feel confident in stating that these are – hands down – some of the best bagels we’ve ever tried! The Australian spin on the American classic dish is a real tongue twister, with all those beautiful flavours mixing together to create a heavenly bite after bite. Ash and Kaya got this fantastic idea to start up a business creating and selling some of the most delicious bagels here in Adelaide, after Ash’s love for bagels came back with him after a trip to the United States of America roughly 6 years ago. The love and passion to have a classic NYC-style bagel was a fruitless adventure, till Ash came up with the idea to attempt producing these bagels himself. After trying (and failing) and succeeding at mastering the art of making “the perfect bagel”, Ash thought of sharing his love for bagel with the rest of us Adelaideans (thank you, Ash)! Each bagel is produced using a 24-hour recipe, which involves the process of resting the dough, followed by boiling and baking them before sale. So, you can be assured that the bagels you get from Bagel Street Adelaide are made fresh daily. There are a number of options of bagels – savoury and sweet – that are bound to make you feel like you’re teleported to the other side of the world! In addition to creating custom bagels, the duo are also involved with baking fresh cookies that may have the same price tag as those from Subway, but are so much fresher, smoother, and plain delicious! There are several types of cookies with fillings of Cherry Ripe, Oreo Cookies, and Mars Bar slices (a personal favourite), so I’d pay them a visit for those, to begin with. For those who may not know, a good bagel is one that is very filling and comes with a range of ingredients that can make an otherwise ordinary choice of a meal very appetizing. We tried The Brooklyn bagel, which comes with a generous serve of thick cut pastrami, cream cheese, sundried tomatoes, Swiss cheese, chargrilled capsicum and baby spinach. If you’ve ever watched When Harry Met Sally, where Meg Ryan is at the food court and has – a moment – that’s the moment we had with the first bite of this bagel. The flavours worked so well with each other and the poppy seed bagel was a fine choice to go with the rest of the ingredients. The cream cheese was smooth, but not overpowering. The pastrami was juicy and the tenderness from the meat mixed well with the fresh vegetables. Bagel Street Adelaide are at Westfield Marion till tomorrow (August 14), and after that, they will keep us posted via Instagram about their movements. So, chuck their account a follow and keep updated with where you can devour the goodies made by these guys – it is the best $12 you’ll ever spend. WHERE: Check the Bagel Street Adelaide Instagram page.